Hormones produced by the thyroid help regulate metabolism and overall energy, and an imbalance can play havoc with your wellbeing. Thyroid disorders are 15 times more common in women than in men. The thyroid function test checks the levels of thyroid (thyroxine and triiodothyronine) and thyroid-stimulating hormones (TSH) in your blood. Depending on your levels, the results could indicate conditions such as hypothyroid (underactive) or hyperthyroid (overactive) thyroid. There are several, broad symptoms related to thyroid dysfunction. If you are noticing any of these, you should get tested for thyroid disorders. Please ensure that you are well-hydrated before you come in for your blood test. The thyroid test is a simple blood test. A needle is inserted into a vein, usually on the inner arm near the elbow, and a small amount of blood is drawn. You may feel a pricking or scratching sensation. Your results will be sent to you by email. If you had a consultation with one of our doctors, the doctor will give you a call first to discuss the results with you. The thyroid, also referred to as a thyroid gland, is found in the neck, behind a cartilage known as the ‘Adam’s apple’. The thyroid is responsible for producing hormones which control metabolism and affect bodily growth rates and other functions. Your thyroid therefore plays an important role when it comes to your health. An imbalance of thyroid hormones can strongly affect your wellbeing. Nodules, or small lumps, on the thyroid, or an enlargement of the gland, can be an indicator either of oestrogen dominance, when your natural hormone levels are out of balance, or of toxicity (either through diet, environmental factors, or chemicals in skincare products). If you have or think you have thyroid nodules, it is advised that you see a doctor to get checked out. 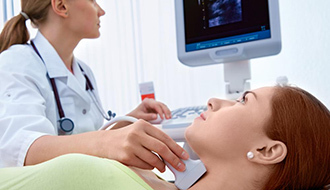 Thyroid checks are recommended if you have a family history of thyroid disorder. Women can start experiencing thyroid-related symptoms as early as their late teens and 20s, particularly if another family member has a thyroid condition. In general, it is recommended you begin getting regular check-ups around age 30, or at any point when you have concerns.